Clinton says she might be holding back a cough in this dramatic photograph captured by White House photographer Pete Souza. 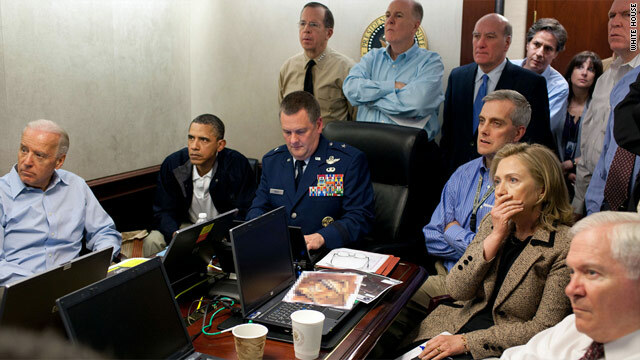 (CNN) – It has become one of the most iconic photographs to emerge in the wake of Osama bin Laden’s killing: a rapt President Barack Obama, Vice President Joe Biden, and Secretary of State Hillary Clinton, among others, watch a live feed in the White House Situation Room as the Sunday afternoon raid in Pakistan was unfolding. The image, captured by White House photographer Pete Souza, shows a particularly dramatic-looking Clinton, with her hand clasped over her mouth and eyes staring intensely forward – an expression that begs the question of just what was unfolding at that instant. But speaking to reporters in Rome earlier Thursday, Clinton said she doesn’t know what was happening during that now-forever memorialized moment, and added her reaction in particular might not be all that it seems. "I am somewhat sheepishly concerned that it was my preventing one of my early spring allergic coughs," she said of the reason why her hand was over her mouth "So, it may have no great meaning whatsoever." Clinton added the Navy SEAL raid was “38 of the most intense minutes,” but as for the particular details behind what will be one of the most famous photographs to emerge from the Obama administration, Clinton was able to offer few clues. "I have no idea what any of us were looking at at that particular millisecond,” she said. obviously she's just let slip an embarrassing garlic burp. Now let's see those pictures Mr. President. Show the pictures, Obama. You wanted to show the pictures of Abu Gharib and Gitmo when my son was dodging IED's in Afghanistan though... thanks so much.